Where can you find self-driving cars? In 2016, 37,000 Americans were killed in traffic accidents. That’s nearly half the population of Merced – a horrifying statistic. Unfortunately, humans are responsible for the vast majority of these accidents. Soon, a new type of vehicle will travel our streets, powered by equally innovative and world-changing ideas: self-driving cars. The new technologies powering these vehicles will exist due in part to Merced County, California. Unlike humans, autonomous vehicles don’t get tired, don’t get road rage, don’t text and are physically incapable of drinking and driving. Using a network of sensors, self-driving cars see further than the human eye in all directions – even in pitch black – and react faster than an Olympic athlete. Earlier this year, we visited Waymo’s facility on the former Castle Air Force Base, now branded the Mid-California International Trade District. That’s where Waymo is testing its self-driving cars. It’s hard to overstate how significant this technology will be in our future. Walking onto Waymo’s facility, dubbed Castle, feels surprisingly familiar. Through a combination of old buildings and new streets, Waymo has created its own custom-built cityscape specifically designed to test and retest complex problems that self-driving cars might encounter on real streets, based on real locations. The types of tricky situations you see in everyday driving – from unexpected jaywalkers to double-parked vehicles on tight streets – are painstakingly recreated and the self-driving cars are tested thousands of times to ensure they can safely handle any situation or occurrence. These meticulously structured tests at Castle, along with Waymo’s 5 million miles of driving on public roads, demonstrate the type of commitment to safety any company bringing such game-changing technology to our streets must hold. Such comprehensive testing is vital to the safe operation of self-driving cars. The fact that Waymo has chosen Merced County for this sort of groundbreaking work is a confirmation that our community fosters innovation and is open for business. We left Castle excited, not just because of the incredible technology we witnessed in action, but because of the promise it holds. Imagine that commute down Highway 99 every morning, but instead of driving in bumper-to-bumper traffic, you can enjoy the morning newspaper (brought to you on a digital screen), catch up on emails, or get an extra hour of shuteye. Building on Waymo’s success, we have secured $6.5 million in the California State Budget to be matched by private and local investments for the construction of a test track and auxiliary facilities that will see Castle become the preeminent high-tech vehicle testing facility in California. After seeing Waymo’s site, and Castle’s new testing facility on the horizon, it’s clear to us that the future is just down the road, and it’s starting in our backyard. Daron McDaniel represents the 3rd district on the Merced County Board of Supervisors. Adam Gray represents the 21st Assembly District, which includes Merced and part of Stanislaus counties. They wrote this for the Merced Sun-Star. Sometime next year, a first-of-its-kind biofuel plant three miles north of Modesto will begin turning old almond and walnut trees into transportation fuel. The intriguing process should keep growers from burning millions of tons of orchard waste, spewing unhealthy smoke into Valley air. That wood instead would be transformed into cellulosic ethanol, a superclean liquid that’s mixed with gasoline and goes into our vehicle gas tanks. Is it safe? And will there be new jobs? Yes and yes, says Aemetis Inc., the Cupertino-based company willing to take a chance on Riverbank, and on new technology. The future plant will need about 40 workers when it joins 38 other businesses at the former army ammo plant southeast of town, now known as the Riverbank Industrial Complex. About 1,000 other people will get indirect jobs trucking orchard waste to the Aemetis plant, trucking away low-carbon cellulosic ethanol, maintaining trucking fleets, and related services. “It is a significant, meaningful impact on the community,” said Andy Foster, president of the firm’s renewable fuels division. Aemetis has a track record in this area, having operated a biofuel plant 14 miles down the road in Keyes since 2011. The Keyes plant uses corn to make conventional ethanol, while the Riverbank plant will consume nut shells and almond, walnut and pistachio trees, saving them from landfills or from being burned in fields. 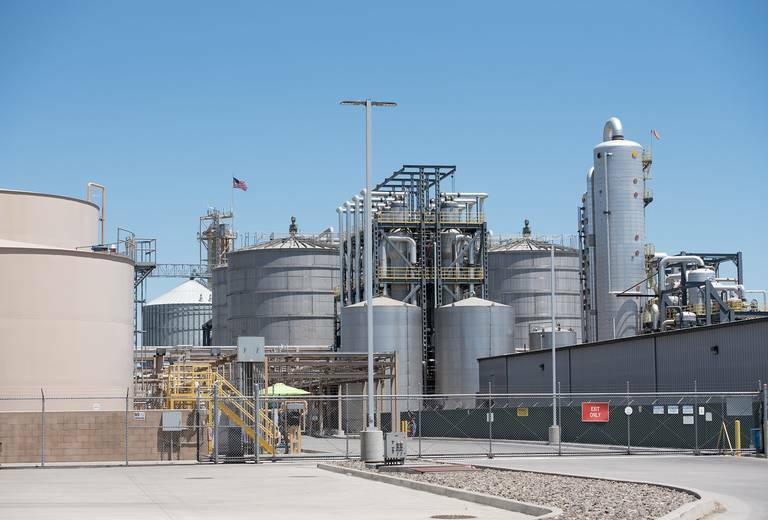 “Cellulosic ethanol is thought to be better for the environment than corn ethanol, as they make (cellulosic) ethanol from woody waste rather than growing corn just to make into ethanol,” said Jaime Holt, spokeswoman for the San Joaquin Valley Air Pollution Control District. Experts calculate benefits with complex formulas taking into account everything needed to grow and harvest whatever is used to make transportation fuel. The so-called carbon intensity score for gasoline, 95, drops to 70 for corn ethanol. But the score for wood ethanol is less than zero; that’s how beneficial it is to reuse a product that otherwise would belch smoke when burned in the open. Aemetis already has a 20-year deal with a tree waste broker who will capitalize on the almond explosion in these parts, with trees covering 1.5 million acres in recent years. The average life of an almond tree is 20 to 25 years, and the Valley produces about 1.6 million tons of tree waste each year. Aemetis also has a 55-year lease on land at the former ammo plant, at Claus and Claribel roads. The company will renovate some old buildings and erect others for the new wood ethanol plant, which could produce 12 million gallons per year. Byproducts include fish meal to be sold to big salmon farms, and others will be announced in time, Foster said. Together, wood ethanol and byproducts could bring annual revenue of $70 million, according to a BioFuels Digest report. Neighbors need not worry, Foster said, because wood ethanol — although flammable — doesn’t explode like propane or petroleum, and Aemetis will install state-of-the-art firefighting equipment that will be second to none, like they did at the Keyes plant, he said. The process does include “advanced arc furnace technology,” or burning; wood is superheated at 3,000 degrees, about the same needed to melt glass, turning wood into a gas before it’s cleaned and fed to microbes in a fermentation chamber. A resulting broth is distilled into cellulosic ethanol, or wood ethanol. Well, this is somewhat uncharted territory. Although scientists figured out how to turn plants into fuel back in the 1800s, companies have had a hard time making a profit since with feedstock other than corn, despite best efforts of heavy hitters like DuPont and Abengoa. Those persevering reached a production high-point exceeding 10 million gallons last year, but that’s a fraction of the federal goal set in 2007, of blending 100 million gallons of cellulosic ethanol into the nation’s fuel supply by 2010. “The bottom line is that cellulosic ethanol has fallen far short of the hype and the expectations,” wrote Robert Rapier in February for Forbes magazine. Some view government subsidies, giving a leg up to emerging renewable fuels technology, as a negative. Aemetis will rely on a $125 million USDA loan for the Riverbank plant; loan requirements included the company successfully operating a demonstration plant in Washington state for 120 days, which Aemetis achieved in a March announcement. The company hopes to produce 12 million gallons per year of wood ethanol in Riverbank, with plans to someday expand to 40 million gallons. The Keyes plant puts out 60 million gallons per year of corn ethanol. Aside from Riverbank, Aemetis hopes eventually to announce additional wood ethanol plants in this area, Foster said. All would employ mechanics, engineers and other manufacturing workers at decent wages, he said. Aemetis apparently is sold enough on Riverbank to compete for the job of taking over the entire 105-acre Riverbank Industrial Complex. Started in 1943, the ammo plant produced shell, grenade and mortar cartridges as a major area employer until 2009. After nearly 30 years of cleaning contaminants from the land and water underneath, the U.S. Army last year conveyed some of the property to an entity overseen by Riverbank City Hall, and is expected to give the rest this summer. “The city is not interested in continuing to be an industrial developer out there forever,” said City Manager Sean Scully. So city leaders in October asked for proposals from prospective master developers, and now are negotiating with Aemetis for the job. Rules set by the city require an employment boost, with priority for people living within 50 miles, and prevent new housing. The newest national ranking of the top universities in the United States shows Fresno State is delivering on its mission to boldly educate and empower students for success. For the third consecutive year, Fresno State is among the nation’s best at combining academic excellence with economic opportunity. Fresno State was selected alongside seven Ivy League institutions, including top-ranked Harvard University; six University of California campuses; and MIT on the list. Fresno State ranks 12th among the 17 public institutions included in the rankings. “Fresno State is proud to once again represent the California State University system in the top 30,” University President Joseph I. Castro said. 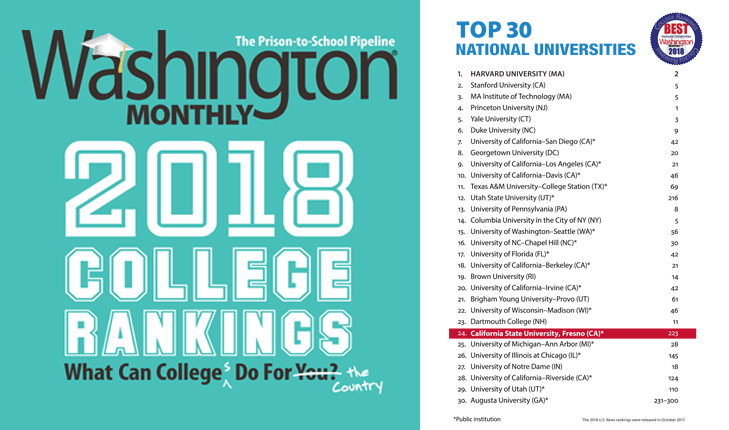 Among more than 400 American Association of State Colleges and Universities members, Fresno State is the only to make Washington Monthly’s top 30. Fresno State and Utah State University (No. 12) are the only Mountain West Conference schools to make the list. Fresno State was also the No. 2 school in the national university category in commitment to spending federal work-study funds on public service. At Fresno State, almost 70 percent of work-study funds go to service. The University was ranked No. 4 nationally in the net price of attending after subtracting grants and scholarships. Castro said Fresno State’s continued presence in the rankings alongside such prestigious universities nationwide demonstrates the potential and value of the University when students, faculty and staff are all working together toward improving graduation rates and making an impact in the Central Valley and beyond. About 80 percent of Fresno State graduates stay and work in the Valley. In May, Fresno State celebrated its largest graduating class ever with more than 6,000 students earning degrees. Enrollment at Fresno State this fall is at an all-time high of more than 25,200 students, and more than 80 percent of those students are from the Central Valley. Fresno State was reclassified as a Carnegie doctoral university in 2016, meaning it was reviewed the past three years with the nation’s top doctoral granting institutions rather than the top master’s universities. Fresno State offers doctoral degrees in nursing, physical therapy and educational leadership. Last year, Fresno State ranked No. 17 on Washington Monthly’s list, and it was No. 25 in 2016. You’ve Heard of Berkeley. Is Merced the Future of the University of California? MERCED, Calif. — As he walks to class at the University of California, Merced, Freddie Virgen sees a sea of faces in various shades of brown. He is as likely to hear banda corridos blaring out of his classmates’ earphones as hip-hop. With affectionate embraces, he greets fellow members of Hermanos Unidos, a peer support group for Latinos that is one of the largest student organizations on campus. In the decades since a ballot measure banned affirmative action in California’s public institutions, the University of California has faced persistent criticism that it is inadequately serving Latinos, the state’s largest ethnic group. The disparity between the state’s population and its university enrollment is most stark at the state’s flagship campuses: at University of California, Los Angeles, Latinos make up about 21 percent of all students; at Berkeley, they account for less than 13 percent. But at Merced, the newest addition to the 10-campus University of California system, about 53 percent of the undergraduates are Latino, most closely mirroring the demographics of the nation’s most diverse state. Merced lacks the same national reputation for academic excellence as other campuses in the University of California system. It has the highest acceptance rate by far (70 percent compared with 16 percent at U.C.L.A. ), and some students across the state do not see it as in the same league as the other campuses. Graduation rates have consistently been lower than at any other campus in the system: 45 percent of freshmen who entered in 2009 had earned a degree four years later, compared with 65 percent at San Diego and 76 percent at Berkeley. Merced has yet to hire the star faculty found at other U.C.s and has a much smaller graduate program. The college does not attract the state’s top-scoring applicants when it comes to test scores and grade-point averages. Eligible students from California who are rejected from other University of California campuses are often funneled to Merced, which offers them a spot even if they have not applied. But more than 90 percent of those students rejected the offer, according to a 2016 state audit. During student orientation each summer at Merced, parent workshops are offered in Spanish. Each year, there are large celebrations and altars for Día de los Muertos and performances from the campus ballet folkorico. Study session snack binges often include tostilocos, corn chips or Cheetos smothered in chamoy, a sticky salty-sweet sauce made popular in Mexico. Merced, which opened its doors in 2005, is an outlier in other ways, too. The campus draws students from all over California, but almost none from other states or countries. Nearly three-quarters of students are the first in their families to attend college. And whereas other campuses are situated near the state’s big urban centers, Merced sits in the middle of California’s Central Valley, a vast agricultural region that has long been one of the poorest and overlooked parts of the state. In the early 2000s, state leaders focused on opening a campus there to serve a region that lagged far behind in educational attainment. Now, more than any other campus, Merced is pivoting to serve a new generation of students. If California hopes to address the vast gap between rich and poor, students such as Mr. Virgen will need to earn college degrees. It is something of a paradox: the future of the state depends on whether the University of California can grow to be more like Merced, and the future of Merced depends on whether it can grow to be more like other campuses. Surrounded by vast green fields on every side, with cows meandering by a small lake, the campus evokes a kind of isolation that is compounded by the long stretch of highway that needs to be traversed to find it. For students coming from cities like Los Angeles and Oakland, it can either feel like relief or a painful shock. Mr. Virgen, a psychology major, often thinks the remoteness deepens the relationships among students. Latinos make up the majority of students at fewer than two dozen four-year public colleges nationally, including the University of Texas at El Paso and Florida International University in Miami. Latinos are also the majority at a handful of campuses and make up nearly 40 percent of all students in the California State University system, which is larger and less selective than the University of California. Merced was not specifically intended as a predominantly Latino school, but many students, professors and administrators see the campus demographics as a point of pride that drew them there. Although Latinos are the dominant culture on campus, there have been signs of discomfort in recent years, as the national debate over immigration arrived on campus. The incident also prompted renewed calls for a student center on campus that would have dedicated spaces for Latino student groups. In part, Latinos make up the majority of students at Merced because many have no other choice in the University of California system. The system promises to admit all students who graduate in the top 9 percent of their local high schools, but that is no guarantee that they will receive a spot at the most competitive schools, like U.C.L.A., Berkeley or San Diego. Often, students who are rejected elsewhere are sent to less-sought-after campuses such as Santa Cruz, Riverside, and Merced, all of which have the highest percentages of Latino students. 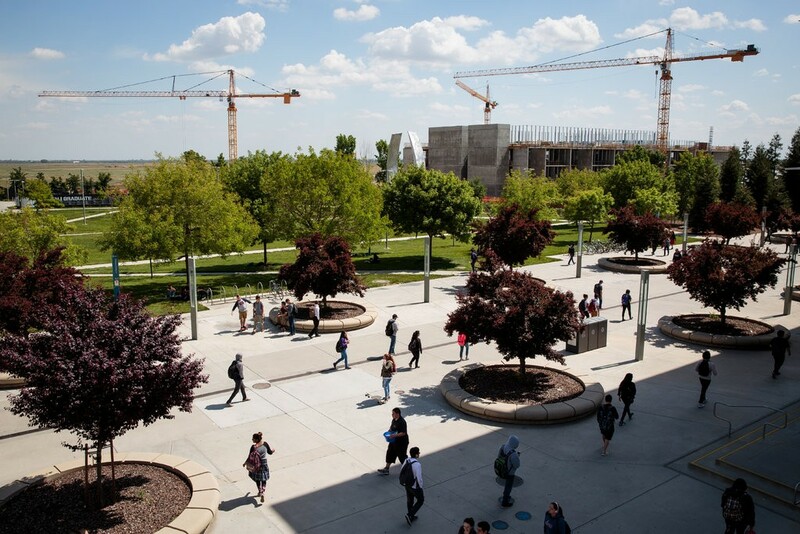 The campus is also attracting students from the surrounding Central Valley, many of whom considered other University of California schools out of reach and applied specifically to Merced. The number of applicants from the Central Valley to the U.C. system have more than doubled since the Merced campus opened, many the first in their families to take that step. As a child in Fresno, Tatiana Acosta did not know anyone who had attended college, other than her teachers. Her mother has spent years working in a packing plant, filling small boxes with figs. Her grandfather, too, had held down mostly low-wage jobs in the agriculture industry after moving to the Central Valley from Nayarit, Mexico. But in her sophomore year of high school, Ms. Acosta was recruited to an Upward Bound program, run by Merced to help high school students get into college. She spent several nights in the dorms at Merced that summer with other low-income students from Fresno, which is about an hour’s drive south. To improve the graduation rate on campus, administrators say they are trying all sorts of strategies for getting first-generation students not only to enroll, but to earn diplomas. Ms. Acosta has struggled to juggle her family life back home with her new life on campus. Last fall, after her older sister was sentenced to several months in jail, her mother was often lonely and depressed, so Ms. Acosta felt obligated to visit. But Ms. Acosta struggled to stay on top of her school work, and ended up nearly failing a course in math and had to repeat a writing class. By the spring semester, Ms. Acosta, who is majoring in management and business economics, told her mother that she could visit only once every two weeks for a night at a time. 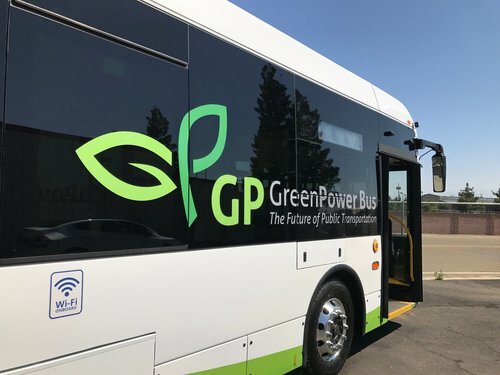 Greenpower Motor Company Inc. (TSXV: GPV) (OTCQX: GPVRF) (“Greenpower” or the “Company”) today announced plans to triple its production capabilities of its zero-emission all-electric buses. The Company has leased a facility with over 50,000 square feet in the City of Porterville as a manufacturing and assembly center, which will open on October 1, 2018. Initial production will focus on EV Stars and then Synapse Type-D school buses. Should the Company reach full capacity, it could lease additional space to increase the size of the facility to over 90,000 square feet. The lease is for a term of four years with an option to extend the term for an additional three years. 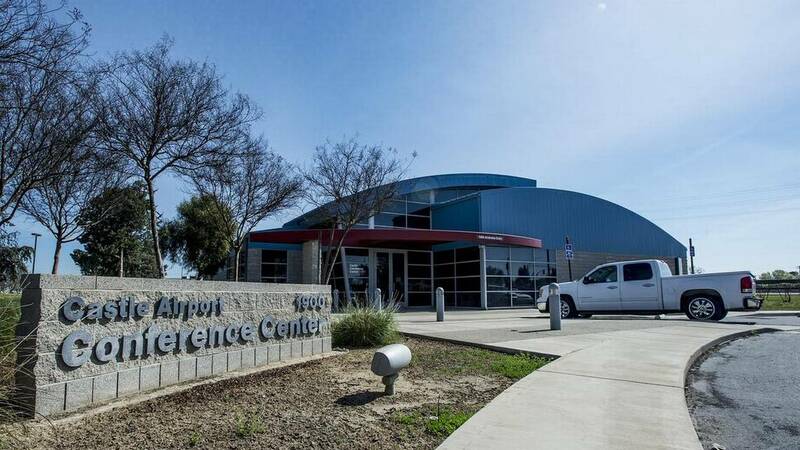 The Company currently operates out of a 20,000-square-foot facility in Porterville. This property will be retained for additional service and office space. Over the past year, the Company has completed plans for the civil work, obtained a grading permit and submitted plans for the construction of a 144,000-square-foot manufacturing facility on the 9.3 acres owned by the Company. All three phases are scheduled to be completed by 2020, with the first phase consisting of 50,000 square feet to come online next year. Total investment in the manufacturing facility is expected to be $6 million to $7 million, which the Company plans on funding from operating cash flow over the next few years. FRENCH CAMP — Sedrick Lawson’s current home is an unwelcoming-looking mattress in a cramped pod in a barracks full of other homeless men at the San Joaquin County sheriff’s Honor Farm. A typical day for the 27-year-old Lawson begins with a breakfast of jail grub and continues with community-service volunteer work loading boxes or landscaping. And after the work, it’s back to the Honor Farm, back to the jail grub, back to the nine other men in Lawson’s program, and back to the so-called mattress, with lights out at 10:30 p.m. But you won’t hear Lawson complain because it’s the life he has chosen, at least for now. Lawson is one of the first 10 participants in the inaugural cohort of homeless men enrolled in a residential job-training program run by Ready To Work, a Stockton-based nonprofit that was awarded $1.4 million in grant funding three months ago by the San Joaquin County Board of Supervisors. Ready To Work’s aim is to set the men up with housing, job training and, ultimately, paying jobs — all aimed at giving participants a better opportunity to succeed once they leave the program after a maximum of 15 months. “The people who are here want to be here and they’re focused,” said Jon Mendelson, Ready To Work’s executive director. Mendelson has based his program — which may reach its 45-man capacity within a month — on one in New York that assists men who are leaving homeless shelters or the criminal justice system. According to data from New York, nearly 80 percent of its participants are employed six months after they have exited and taxpayers save $3.60 for every dollar spent on the program. Ready To Work is providing its participants training, food and sleeping quarters. After the initial adjustment to the program, the men are dispatched as supervised work groups in the community. They are paid salaries, and with housing and food taken care of, the men have an opportunity to build a nest egg by the time they exit the program for their own apartments and a chance to build a new, independent life. “A lot of people don’t care, but this program shows you that people actually care about people and they want you to be the best you can be,” Lawson said. Lawson, who has a high school diploma and some college credits, moved from North Carolina to California several years ago, joining his mother in Stockton. Strained family relations eventually pushed him out of his mother’s door and into the Stockton Shelter for the Homeless, where he lived while working for short stints at Walmart and for an alarm company. While at the shelter, Lawson said he eventually met someone who knew of a job traveling with California Carnival Company setting up and tearing down the rides as various fairs moved from one city to another. But the backbreaking work and 16-hour days were not what Lawson wanted for the rest of his life, so he returned once more to Stockton, staying at the shelter and at the Gospel Center Rescue Mission. When Lawson learned what Ready To Work was doing, he jumped at the opportunity. Critics of the program — most notably the incoming sheriff, Pat Withrow — have voiced reservations about placing the Ready To Work group’s yard area on the other side of a fence from inmates. Leading visitors Wednesday around the yard, which includes a pingpong table and a basketball court, Mendelson pointed to 12-foot perimeter fencing covered with slats and topped by barbed wire, and he said there have yet to be any security breaches. Additionally, Ready To Work Program Director Deborah Johnson just happens to be the retired warden of the Central California Women’s Facility in Chowchilla, so she knows a thing or two about security. Johnson said collaboration between Ready To Work and the Sheriff’s Office led to the enhanced fencing and the barbed wire that tops it. Lawson said that in his mind, the precautions are unnecessary. His plans, he said, do not include attempting to interact with inmates. He has loftier visions. An October opening is planned for the Fresno Lazy Dog Restaurant & Bar, which is midway through renovating the former Elephant Bar on Blackstone Avenue. Lazy Dog is looking to hire 200 workers. A hiring center opens Friday, Aug. 24. Back in March, The Fresno Bee told you about Lazy Dog’s plans to bring its comfort food and dog-friendly patio to Fresno. The restaurant is looking for bartenders, servers, cooks, bussers, hosts and hostesses. People interested in applying are encouraged to visit Lazy Dog’s website or the hiring center at 317 W. Bedford Ave., suite 101. The center will be hold interviews from 9 a.m. to 6 p.m. Mondays through Saturdays. Veggie burgers like this will be on the menu at the Lazy Dog Restaurant & Bar, which is scheduled to open in October in the former Elephant Bar on Blackstone Avenue. Hundreds gathered to celebrate the opening of the first three buildings of the Merced 2020 Project. Less than two years after breaking ground on its unprecedented campus expansion, the University of California, Merced, last week celebrated the opening of the first three buildings of the Merced 2020 ProjectOpens a New Window..
More than 400 people were on hand for an opening celebration Thursday, including UC Merced Chancellor Dorothy Leland and UC President Janet Napolitano. Leland and Napolitano also met with students Friday, and visited with more students and their families during move-in. On Saturday, students moved into two brand-new, mixed-use residence halls, which feature more than 700 beds in addition to classrooms and retail space. Campus community members, supporters and their families got a glimpse of three new buildings. At final delivery in 2020, the $1.3 billion initiative will comprise 13 new buildings featuring new classrooms, research labs and student life facilities that will allow the university to accommodate up to 10,000 students. 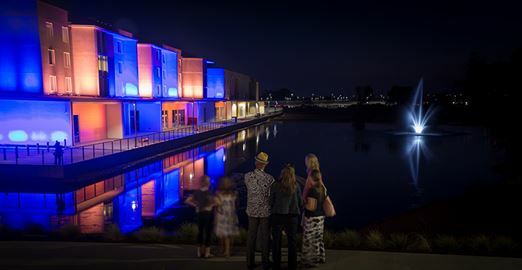 The centerpiece of the project, and the site of last week’s celebration, is the Pavilion — an iconic 600-seat dining facility overlooking Little Lake. The Pavilion is complemented by two new residence halls that have been strategically designed to form a pedestrian-friendly corridor that blends housing with classrooms, study lounges and student activities. The first phase expands UC Merced’s ability to provide access to a world-class education to more of California’s best and brightest students, and future phases will include state-of-the-art laboratories to help further the university’s research mission. 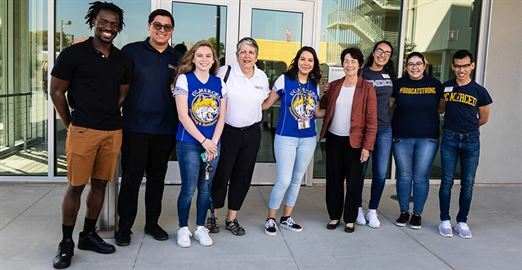 UC President Janet Napolitano and UC Merced Chancellor Dorothy Leland met with students and toured new housing facilities Friday. 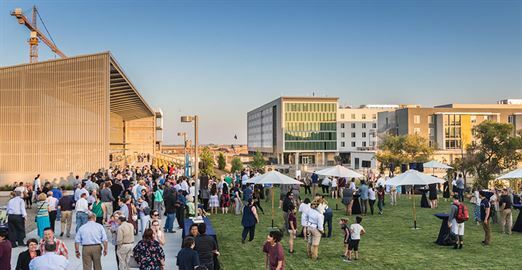 The unique public-private partnership UC Merced is using to develop the project has garnered numerous awards and recognitionOpens a New Window. from across the country, including being named Social Infrastructure Project of the year at last year’s P3 Awards. The agreement provides the university with contractual assurance that the buildings will be well maintained for decades. With 600 employees on site every day, the project is expected to generate a total of $1.9 billion in regional economic impact and $2.4 billion statewide through its completion. Development partner Plenary Properties Merced (PPM) and lead contractor Webcor joined the university in commemmorating the completion of the project’s first phase. Webcor has placed a strong emphasis on hiring local workers, including 17 San Joaquin Valley subcontractors. Seven UC Merced students honed their analytical, engineering and communication skills as interns on the project, and Webcor has since hired them as full-time employees. Cosmetics maker L’Oréal USA says it is relocating its professional salon distribution operation to the Tejon Ranch Commerce Center in Kern County, south of Bakersfield. L’Oréal USA’s SalonCentric unit will occupy the remaining 240,000 square feet of space in a 480,000-square foot building developed in partnership with Majestic Realty Co., says the owner of the center, Tejon Ranch Co. (NYSE: TRC). As part of the move, SalonCentric will relocate its Valencia distribution center to Tejon. SalonCentric, headquartered in St. Petersburg, Florida, and operating in 48 states, is distributes salon professional products. Earlier this year, Dollar General (NYSE: DG) leased the initial 240,000 square feet of space within the partnership’s building as it increased its footprint at TRCC by nearly 40 percent. “It’s all about access,” says John DeGrinis, senior executive vice president of Colliers International, who represents TRCC. L’Oréal USA is also applying for economic incentives administered through Kern County’s “Advance Kern” policy, which provides eligible companies the opportunity to seek reimbursement for a portion of the property and sales taxes they generate. The policy is only applicable to unincorporated areas of Kern County, like the Tejon Ranch Commerce Center. The Tejon Ranch Commerce Center is Tejon Ranch Co.’s 1,450-acre master planned commercial/industrial development located at the junction of Interstate 5 and Highway 99 in Kern County, about an hour north of the Los Angeles basin. It’s entitled for more than 20 million square feet of commercial and industrial space, with about 15 million square feet still available. Los Angeles-based fast food company Fatburger is getting bigger, adding stores in Southern California plus one in Bakersfield in the Central Valley. It will be its first foray into the Valley. FAT Brands Inc. (NADAQ: FAT), parent company of Fatburger and Buffalo’s Express, says the expansion will see the development of 12 new co-branded Fatburger and Buffalo’s Express restaurants The expansion is to include a Fatburger and Buffalo’s Express restaurant in a new casino being developed by the Quinault Indian Nation. The Southern California locations will span across Orange County, Simi Valley, Rialto, Glendora, Colton, and Eastvale. The locations are slated to open within the next year. Specific sites for the stores were not announced, with the exception of the casino-based outlet. The two brands offer menus of classic fare including made-toorder burgers, milkshakes and fries at Fatburger and customizable, boneless and bone-in chicken wings and fresh salads at Buffalo’s Express. “We are excited to expand our existing presence on the West Coast with these upcoming locations,” says Andy Wiederhorn, CEO of FAT Brands. The company currently owns six restaurant brands Fatburger, Buffalo’s Cafe, Buffalo’s Express, Hurricane Grill & Wings, and Ponderosa and Bonanza Steakhouses, that have over 300 locations open and more than 300 under development in 32 countries.